A germicidal lamp is a special type of lamp which produces ultraviolet (UVC) light. This short-wave ultraviolet light disrupts DNA base pairing causing formation of pyrimidine dimers and leads to the inactivation of bacteria, viruses, and protozoa. It can also be used to produce ozone for water disinfection. High-pressure lamps are much more similar to HID lamps than fluorescent lamps. 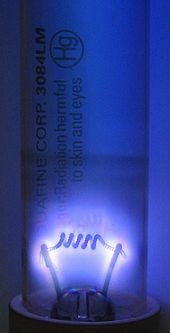 These lamps radiate a broad-band UV-C radiation, rather than a single line. They are widely used in industrial water treatment, because they are very intense radiation sources. They are as efficient as low-pressure lamps. High-pressure lamps produce very bright bluish white light. UV-C LEDs use semiconductor materials to produce light in a solid-state device. The wavelength of emission is tuneable by adjusting the chemistry of the semiconductor material, giving a selectivity to the emission profile of the LED across, and beyond, the germicidal wavelength band. Advances in understanding and synthesis of the AlGaN materials system led to significant increases in the output power, device lifetime, and efficiency of UV-C LEDs in the early 2010s. Short-wave UV light is harmful to humans. In addition to causing sunburn and (over time) skin cancer, this light can produce extremely painful inflammation of the cornea of the eye, which may lead to temporary or permanent vision impairment. It can also damage the retina of the eye. For this reason, the light produced by a germicidal lamp must be carefully shielded against direct viewing, while reflections and dispersed light is not an issue. A February 2017 risk analysis of UV-C lights  concluded that ultraviolet light from these lamps can cause skin and eye problems.